Now through March 31st, Amazon Home Services is offering up an additional $30 off whenever you book select cleaning, installation and repair services directly on Amazon.com (discount applied at checkout). You can save on services such as furniture assembly, house cleaning, plumbing & more! Did you know that Amazon Home Services handpicks the best service providers in your neighborhood and require all service pros to be background checked, insured, and licensed if applicable. There are 2 ways you can purchase home services. You can add a predefined, pre-packaged service with an upfront price right to your cart and schedule your appointment time frame. Or you can submit a custom request for a home project you define, and receive estimates from nearby pros over email. Once you’ve booked your service, you’ll select 3 preferred dates and time frames. Your pro will confirm your appointment arrival time frame over email, in most cases, or by phone. Note that the payment is issued directly from the card you have on file in your Amazon account. Amazon.com now is offering this Honeywell Wi-Fi 7 Day Smart Programmable Thermostat for only $74.99 shipped. Compatible with Amazon Alexa, Google Home and more, this thermostat allows you to be alerted of temperature swings and to make adjustments remotely. It continually learns when to pre-heat/cool your home so you are comfortable at your programmed times. 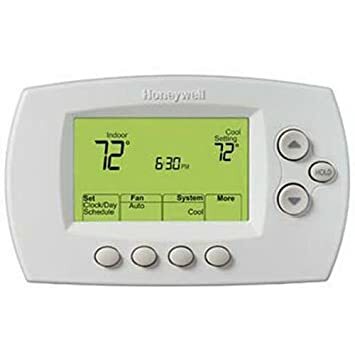 For a limited time only, HomeDepot.com now you can get this Honeywell Wi-Fi Programmable Touchscreen Thermostat for only $74 shipped (regularly $89). This thermostat can easily be viewed and controlled by a free app for your iPhone, iPad and/or Android operating systems. It offers up to seven day programming with four program periods per day to help you save money. You’ll even know when to change your filters with the handy filter change indicator.